Well, I've let time get away from me, and now I'm three months behind on our report. I'm going to do a brief catch up here, then I'll just have to do better from now on. October: This month we focused on the joy of goal striving, priorities and order. I struggled to teach this one as well, but we did make some headway. We learned about goals and dreams and about achieving them. At first Helen and I set a goal for her to poop in the potty every day (since that is one of her great struggles), but it didn't go very well. I think it was because it was more my idea than hers. Then she wanted to try to learn how to sew. So we decided on some steps, and started forward. She learned to thread cardboard shapes, and then, thanks to Grandma Raty, we started learning needlepoint. We're still working on that one, and, unfortunately, we didn't continue to be diligent about it after October. But it's not over yet. She'll learn to sew yet! We also talked about the difference between order and mess and why it's important. Helen learned how to wipe down the bathroom sink, and she and Eric have helped vacuum their room every week since. So we made a little headway in that department. November: This month was the joy of trust and the confidence to try. Someone had offered to teach one-on-one preschool swim lessons at an indoor pool, and so we were going to try that for the first two weeks of November. But unfortunately it fell through. I did find some excellent books at the library. One was called Be Confident, and the other was called Be Positive. They were both by Cheri Meiners. We also learned about a spider that kept trying to climb up his thread even when he fell down over and over. And we learned that mistakes were OK if we keep trying and just learn from them. December: This month I kind of bombed it. A lot of things came up and we didn't do much preschool. We were supposed to focus on the joy of family identity, security and pride. But we did have some family gatherings, including a funeral for Great-Grandma Kitchen. And Grandma Raty gave us an awesome family portrait for Christmas! We also started an ancestor book, where we are writing down family stories. I'm pretty excited about that. So, despite the craziness, or because of some of it, we had some good family experiences. It's over halfway through October, and I'm finally writing about September. But it's better late than never. In September, we focused on the joy of obedience and decisions. This was actually kind of a tough one. The book had some suggestions, but there weren't a lot, so I had to come up with a lot on my own. We had a lot of discussions, including about what a law is, what obedience is, what a decision is and what happens when there are no laws. We had a puppet show about making good decisions. We also sat down as a family and made a Family Rules Chart that we now have hanging in our hall. We had a Family Home Evening lesson about obeying the commandments, and later one about saying you're sorry. We talked a little about repentance too. We also learned safety rules for inside and outside the house, and the kids drew pictures for our safety rules chart. Then we made up a song to help them learn our phone number and address, and discussed what to do if you get lost. I feel that this month kind of lacked the same fun and enthusiasm as the last few months. I think that, despite the subject matter, this "joy" could be a lot of fun too. If we make it fun, then the kids will learn that obeying rules and making good decisions is a happy thing. I hope I can figure out how to do that before it's time to go over this again for Eric. If anyone has any ideas, feel free to let me know. Eric has learned to count to 12, but he is still working on recognizing the numbers. Helen has started reading lessons again, and this time we're making progress. I'll be so excited when she reads a book aloud to me. This month has been really busy, so we didn't do as much preschool as I would have liked. This month was the joy of imagination and creativity, so it's a bit of a bummer that we didn't have more fun with it, especially since Helen loves to create things. However, we did have some fun with it. We also made some salt dough beads. Helen shaped and painted most of them herself, and she had so much fun with it. She had to have some help stringing them onto a thread since we made the holes a little too small. Helen also helped me make an apple cake and a cherry pie. She had a lot of fun with the cherry pie, which she asked to make. I let her cut some stars out of the top crust. I figure that cooking is a creative thing, so I thought it worked well. I also came up with way to teach numbers to the kids. I used a baby food jar, and I put slips of paper with ideas like read number books, count fingers, play with Montessori rods (which I made), etc. When want to learn numbers, we just pull out the jar and draw a slip of paper or two to see what to do. It seems to work for us. 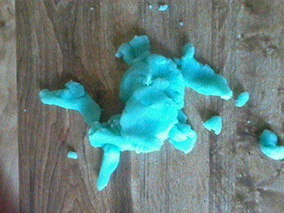 Here is a clay dough creation that Helen made of herself. This month we focused on the joy of interest and curiosity. This month was a little hard to plan since I wasn't exactly sure what to do besides science experiments. But we ended up doing more than that. We did do several science experiments with water and light. The experiments never went as planned, but I think the kids learned a few things from observation. One example of an experiment that didn't go as I thought it would was when I put a napkin in a cup and turned the cup upside down inside the water. I asked Helen what she thought would happen. She told me that the napkin would get wet. I was excited, since I thought that she'd have to rethink her answer because of the air bubble that would be trapped in the cup and would keep the napkin dry. Well, the napkin ended up being wet on the top, so when I asked Helen to touch it, she said matter-of-factly, "It's wet." I redid the experiment, but I kept getting the napkin wet. I tried to explain about the air bubble, but I don't think it had as much of an effect as it would have if the napkin was completely dry. Oh, well. We also had several discussions about questions, such as why they are good, types of questions how to get answers to questions. We also talked about praying about questions. Since the Boxcar Children try to be observant and ask lots of questions to solve their mysteries, I picked out a Boxcar Children book and read it to Helen. At first I wasn't sure if she liked it. But she always wanted to read more. I let her pick out two more the next time we were at the library. She enjoyed both of them. Just before the climax in The Mystery at the Fair, I stopped at the end of the chapter. Helen looked up from what she was doing and exclaimed, "What did the man in the baseball cap say?" She was dying to hear more. I just had to laugh. We also started a new tradition. I bought a hardback book, and we are keeping a "Family Interest Book." It was a suggestion from Teaching Children Joy. When we find something interesting that we learned or observed, or that we are just curious about, we write it in the book. I write them for Helen. Here is one of her entries: "Sweet potatoes are hard. I tried to touch one. I saw them at Broulims." I have yet to write one for Eric, but I am sure we'll find something for him to contribute soon. I hope we can keep this book going the whole time the kids are growing up. Eric has his colors and shapes down pretty well. So for the second part of the month we started focusing on numbers. He's been excited about that. He wants to know numbers and letters like Helen. We've been reading number books and singing number songs. I used star stickers and a piece of black construction paper to make him his own number book. Helen was having trouble focusing through a whole reading lesson last month, so I decided to put that aside for a bit and work on potty training. My theory is that if she can focus enough to potty train, she might be able to focus enough to read. She was reading two letter words, but then she started guessing and looking everywhere else but at the page in front of her. So we'll just wait on that. This month we studied the joy of the earth. It was a good month to study it. We did lots of fun things, but I think our favorites were going to the zoo and camping out. We went to Tautphaus Zoo in Idaho Falls. Brian and I had the most fun, since it was so hot and the kids got tired. But I know that they still enjoyed it. We loved seeing the otter show off for us under water. Helen told me afterwards that her favorite part of the zoo was seeing a snake from Asian that was pink with purple stripes (Imagine that--pink!). She still talks about it. She also liked the pink flamingos. Eric really liked the tiger. Eric also loved feeding the goats. To me, the zoo was the highlight of the month. But if you ask the kids, I think they would tell you that their highlight of the month was our campout with Jeff, Heidi and their kids. Jeff took us up above Mesa Falls and Warm River. The cousins had a lot of fun playing together and roasting hot dogs and marshmallows. That night, as we were going to bed, Helen saw the stars, which were amazing. She must have been inspired, because she started quoting poetry. The next morning, Helen woke up really early, so I took her on a hike through a mountain meadow. It was very beautiful. The sun was just coming up, and there were wildflowers everywhere. Helen burst into song, singing primary songs about nature. So I know she was feeling it! We did so many other things too. We've also listened to Vivaldi's Four Seasons and Peter and the Wolf, for a touch of culture. We've tried yoga that imitates animals, and we sang nature primary songs every night. I also checked out a Farms discovery kit from the library, and Helen was enamored with Charlotte's Web. She loves pigs, and she's decided that she likes spiders too. We also checked out the Ecology discovery kit, and we got some books about plants and food from Usborne. We put some seeds in a jar and watched them sprout and grow (which is something I've always wanted to do). I also bought a bird feeder, and it has been so much fun to watch the birds up close. The birds became really comfortable, and they'd eat while the kids played underneath, which was so cool! We've seen some birds that we haven't seen before, too. So now we have finished our second month of preschool. Our focus this month was the joy of the body. It was a lot of fun, and we all learned a lot. One day Helen told me, "I have a beautiful body!" That is exactly what I was hoping she'd feel. The third week we talked about how our bodies are temples and how to take care of them. We learned about the Word of Wisdom. And then the last week was a lot of fun. I found a Youtube channel called Dance and Beats. It has dances for preschool kids. I picked three that I thought were good, and we danced Monday, Wednesday and Friday for preschool. We danced the crab walk, little butterfly and catch a fish. Eric really liked catch a fish, and Helen liked little butterfly. They both really liked crab walk. It was a lot of fun to use our bodies for art! I wanted to take pictures of the kids dancing, but I couldn't find the camera all that week. For the first part of the month I was using Sandi Queen's Language Lessons for Little Ones Vol. 1. But it wasn't meeting Helen's needs. It was a lot of fun in some ways. But Helen was way beyond it when it came to letter recognition. But she wasn't ready to write the letters yet. She tries, but it wasn't working very well. And I realized I needed something that didn't require a child to learn to write while they are learning to read. The curriculum that I would prefer is out of print and so is very unaffordable. So I checked out a whole stack of books on phonics and teaching children to read. I also grabbed The Ordinary Parent's Guide to Teaching Reading, by Jesse Wise. I'd had an impression that it didn't use sight words to help the kids get started before they learned the rules for those words (which isn't correct). But my sister-in-law has used it for her kids, and I respect the author a lot, so I thought, why not? I discovered that it was similar to the curriculum I had wanted, and we have been using it. The first 26 lessons review the letter sounds, which is what Helen needed. We are about half way through that part. And Helen has been doing very well! It's just what we've needed. I'm hoping that Helen can start reading short words by the end of June. We also focused on colors and shapes (mostly colors) for Eric. We made a color sorting train (that turned into a color train that I just put on the wall) like one that I found online. He also did a shapes puzzle and put it together really well. We also did a shapes collage all together. Helen ended up doing most of it. One week we also checked out a colors discovery kit from the library, and that had some good books, including The Color Kittens by Margaret Wise Brown. I think that one was Eric's favorite. So far preschool has been a lot of fun and we're all (including me) learning a lot. I've finally come up with a more formal long-term plan for Little Pink Girl's preschool. I'm incorporating things for Little Boy Blue as well since he's involved most of the time. Last fall (or summer, I can't remember which) I read a book by Richard and Linda Eyre called Teaching Children Joy. I loved it. I feel as though is more of a program for boosting E.Q. (emotional quotient) rather than I.Q. Recent studies have shown that the real indicator for success is E.Q. rather than I.Q. It has 13 "joys" to focus on. The authors suggest that you put together a co-op school with other mothers, and they even have a whole curriculum all prepared that you can use (find it at valuesparenting.com). It costs $100 per family ($150 the first time), and it sounded great. It really is a lot cheaper than any other private school, and I like the idea of Little Pink Girl having some time with friends a couple of times a week. She thrives on social interaction. But we just didn't have the money to do something like that. But when I re-read the introduction to the book (which, by the way, you can get for free on valuesparenting.com) I realized that I could still do it all at home. We'd have to work a little harder to provide the social interaction Little Pink Girl needs, but I could do everything else. So, as the book suggested, I am focusing on one "joy" each month and planning our school time around it. I am also using Sandi Queen's Language Lessons for Little Ones since Helen is ready for it. We do that three days a week. Then two days a week we are focusing on Shapes and/or colors for Little Boy Blue until he has both down. Both of them do whatever activity we are working on, so it's a good review for Little Pink Girl and a good preview for Little Boy Blue. We started in April this year. This first month has been very informal as I've been figuring out exactly what it is we need to do. The joy for this month is "spontaneous delight." That really means to me just having fun. :) So it's been a good start to preschool. We've blown bubbles, had tickle sessions, read fun books, popped popcorn and watched it fly, played with play dough and made cookies. We also used a Shapes discovery kit from the library, and I've been pointing colors out to Little Boy Blue all over the place. We did a color dot hide-and-seek, which actually didn't go so well. They didn't want me to hide the dots; they just wanted to play with them. At the end of the month we got Language Lessons for Little Ones and started it. Helen was most interested in learning the letters and not so much the art and poetry. I had her narrate one book back to me, and she did ok for the first time. But we need to do it more. I'm afraid I didn't take any pictures, but this month I have a plan for every day and I'll take pictures to share with you next month. I'm also writing it all down in journal so I can remember more of what we did.